The Suffolk 3 Drawer Bedside cabinet is the perfect addition to any bedroom. The Suffolk 3 Drawer Bedside in dove grey is a beautiful choice that works in traditional and modern bedrooms. There are 3 useful drawers, ideal for storing your bedside essentials and removing clutter from the bedroom. 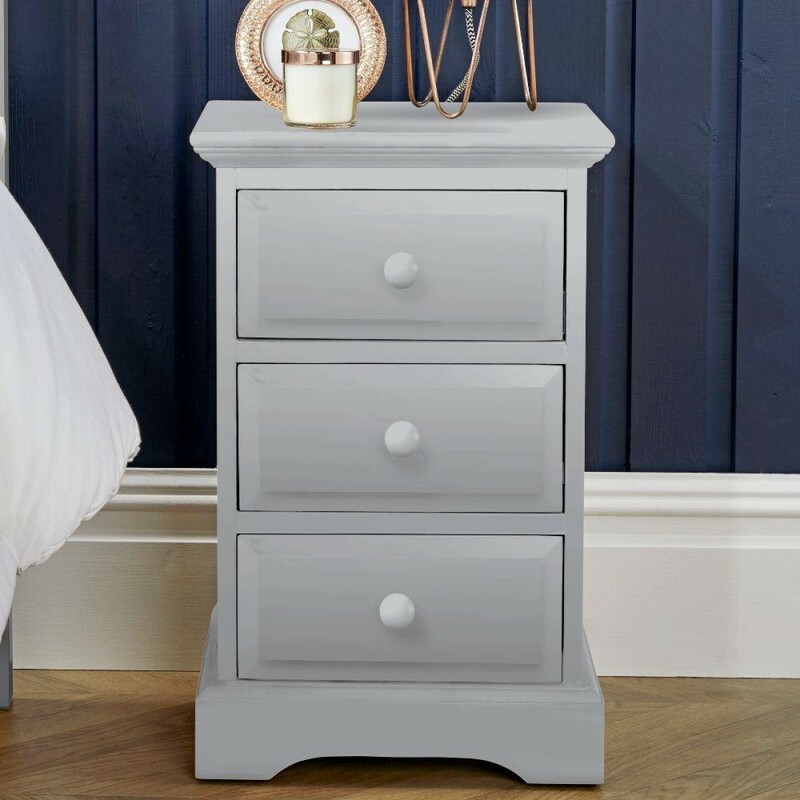 Create a relaxing space with the Suffolk 3 Drawer Bedside in dove grey. Make the best use possible of the space next to your bed with the Suffolk 3 Drawer Bedside in dove grey. The addition of 3 extra drawers can make all the difference to the amount of storage you have available. Use the drawers to store anything from your smaller items of clothing to your chargers, favourite books or jewellery. The surface of the Suffolk 3 Drawer Bedside is the perfect base for your bedside lamp, glass of water and alarm clock. The Suffolk 3 Drawer Bedside in dove grey is built to last. This is a quality piece of bedroom furniture made from excellent materials. The strength and attractive design is achieved through the use of MDF plywood, pine veneer and solid pine. The end result is an attractive bedside cabinet with lots of drawer space and an attractive design. The Suffolk 3 Drawer Bedside provides an extra 3 drawers for the bedroom. The 3 drawers each have a single handle for access and are all the same size. Use the drawers to help organise your bedroom and encourage relaxation and a restful sleep. The Suffolk 3 Drawer Bedside is part of the stunning Suffolk Dove Grey Wooden Bedroom Furniture Collection. Use the bedside cabinet in single, double or master suites. Combine with other items from the Suffolk collection in dove grey to create a united space.